Quick overview Focusing on the fate of refugee children and young adults, it is aimed at children and adult readers alike, and features work from Michael Morpurgo, Eoin Colfer, Kit de Waal and Simon Armitage among many others. From the editor of A Country of Refuge comes an anthology of new writing on one of the defining issues of our time. Focusing on the fate of refugee children and young adults, it is aimed at children and adult readers alike, and features work from Michael Morpurgo, Eoin Colfer, Kit de Waal and Simon Armitage among many others. 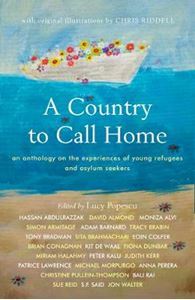 There are tales of home, and missing it; poems about the dangerous journeys undertaken and life in the refugee camps; stories about prejudice, but also stories of children's fortitude, their dreams and aspirations. A Country to Call Home implores us to build bridges, not walls. It is intended as a reminder of our shared humanity, seeking to challenge the negative narratives that so often cloud our view of these vulnerable young people, and prevent us giving them the empathy they deserve. The book will include newly commissioned stories, flash fiction, poetry and original artwork from some of our finest children's writers: David Almond, Chris Riddell, Moniza Alvi, Sita Brahmachari, Peter Kalu, Judith Kerr, Patrice Lawrence, Anna Perera, the late Christine Pullein-Thompson, Bali Rai and S. F. Said.